The lasagna speaking of the pasta, is a noodle that has an elongated flat rectangular shape that is porous, specifically designed so it may coat itself completely and render the most savory sauces of the Italian tradition, but they are still a perfect match with most homemade sauces! The lasagna, speaking of the dish, is a preparation usually made from a recipe with layers of lasagna pasta alternating with cheese and a meat sauce layers and often some bechamel sauce as well. The lasagna recipe comes from Northern Central Italy, more specifically Emilia Romagna. 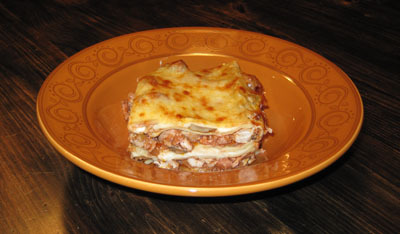 The Italian word lasagna evolved from the ancient Greek word λάσανα / Lasana which translates to "unleavened bread". This word was later picked up by the Romans to designate a cooking pot: the "lasanum". The Italians then adopted the word to designate the dish which was to receive the tasty noodles with sauce. Nowadays, the word lasagna (lasagne in italian plural form) strictly refers to the food itself. The earliest written references we know of to date are from the thirteenth century; lasagne recipes from this time did not use tomatoes yet, as they were still unknown to the Europeans ... Depending on the lasagna recipe, different cheeses are used, but most of the time the selection revolves around ricotta, mozzarella and Parmesan. But of course we won't stop there on this site... try Gorgonzola, broccoli and nuts which is innovative in a lasagna and totally delicious; but please search through our large selection of lasagna recipes to find the next lasagna you will try! The Parmesan cheese, served grated over pasta, was already commonplace in the fourteenth century. It was introduced by the Duchess of Parma from France, who married a grand son of Louis XV. The real original parmesan or "Parmigiano Reggiano" - from the Emilia Parma area - is one of the most famous cheeses in the world. With the distinction of being almost an entirely ripened cheese. Salty and sometimes spicy, it is an essential part and found in most europeans kitchens. Its production in the provinces of Parma, Mantua and Bologna is between April 15 and November 11. Protected by a DOC, it isn't every cheese that it is made with a similar procedure that is worthy of being called "Parmigiano Reggiano"; it is made from partially skimmed cow's milk and then immersed in brine for two weeks before being put to refine (one year or more and up to 4 years for the "stravecchio"). With only 32% fat, the pressed cheese and baked, in black crust (coated umber ground and oil) is hard, brittle and brittle, straw-colored with a fruity, sometimes spicy that required length on the palate. This granular consistency has earned the cheese the generic name "grana" in Italian, for cheeses of the same type such as the "bagozzo Brescia". It is always best to grate it yourself, before use, rather than buying it pre-grated in bags... It can also provide taste, cut into shavings with a knife or special tool, served with a Lambrusco wine. After having a earned a substancial fortune by supplying the french army during the Fronde, Louis Béchameil (1630-1703) was made a "marquis" by the King of France; henceforth known as the Marquis de Nointel he was primarily a financier: farmer-general, superintendent of the house of the Duke of Orleans, intendant of Brittany. This gourmet, enlightened art lover, bought the office of steward of Louis XIV. The sauce that bears his name was in fact the result of the improvement of an older sauce made with cream developed by François Pierre de la Varenne (1615-1678), a cook of the Marquis of Uxelles, who dedicated this recipe to him, as often the cooks found in noblemen's cuisines did; the creation would bear the nobleman's name instead of the cook who created it. This dedication also triggered a sarcastic remark from the old Duke of Escars: "Is he happy, this little Béchameil! I had to use the sliced​chicken breasts and cream for over 20 years before he was in the world and see, but I've never had the good fortune to be able to give my name to the simplest sauce! " . First the sauce took the exact Béchameil name, and later on, the name becomes a Béchamel, after some time passed the name lost its capital letter at the end of the eighteenth century. The current name is béchamel or even béchamelle in french or besciamella in italian... Here is the page of this site with the bechamel sauce recipe. Mozzarella is a fresh cheese (not aged) made with a spun dough. It is traditionally made with buffalo (bufflone) milk but nowadays it also uses cow's milk for industrial production. It is produced in the form of slightly flattened balls, surrounded by a thin crust that is neither sticky nor rough. Native to the swampy areas of Italy, specifically Campania, it sports a pure white color leaning towards yellow when it is made out of cow's milk. This Italian specialty is named "mozzarella" following one of the essential steps in its manufacture: "Mozzata." To sum up the chain of production of this cheese, there is a first step which rennet is added to milk to make the milk curd, and a second where it is recovered as the curd is cut and dipped in the hot water. The third step, spinning, spinning is the mozzarella to make it more elastic. Finally, in fourth place, "Mozzata", the dough is cut to give the cheese its final size and shape. It is important to understand the history of the mozzarella, interest in the buffalo, which are closely related to the cheese. In the seventh century, the Italians brought back the buffalo from Asia in order to help farmers work the land of their swampy areas, since these animals with large hooves could easily move, without sinking in the mud. Thus, the milk of buffaloes, with its special flavors initially had no value, so it was used for making mozzarella. The new product had a huge success and was produced from the year 1600, publicly traded in Naples and Capua, arriving just as gold and wheat. At first, the mozzarella was made up mainly of buffalo milk, or with its growing success, the buffalo producing only small amounts (18 to 20 liters), cow's milk was used to compensate for the production shortfall. Accordingly, the classic mozzarella mozzarella is the "di Bufala Campana". In 1996, a label is created specifically for the buffalo milk mozzarella, the PDO (Protected Designation of Origin), to regulate the production of this cheese at Campania in Italy. Today, mozzarella continues to expand its reputation and made many followers, as the Swiss, who are likely to cite this as their favorite cheese. Note also that the production of mozzarella having many industrialized, 90% of production is based on cow's milk.